With Autosub6000 on a mission, the ship headed towards Mount Dent to dredge the seafloor, using just a small metal bucket (to avoid damage) attached to a cable. We travelled for about a mile, with our bucket collecting sand, sludge and loose rocks. These will be used to help determine the geology of the seafloor. This is a really low-technology method of sampling, used on the famous early oceanographic expedition of HMS Challenger in the 1870s. Some things never change or need to be developed! With plenty of activity happening in the water, we went with Ian, the ship's Chief Engineer, for a tour of the important areas of the ship we never normally see. 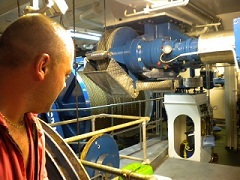 Ian and his team of engineers look after all the ship's fixed equipment, for example engines, winches, propellers, electricity generation and water. The RRS James Cook carries around 736 tonnes of fuel when fully loaded, and uses 10 tonnes per day when travelling at her average speed of 10 knots. There are four main engines, but only two tend to be used at any one time. Should one fail, a third engine will automatically start, and alert the engineers of the action taken. 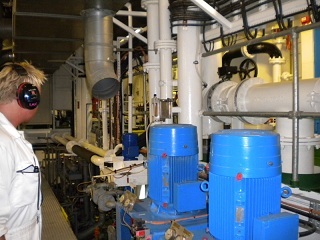 The engine room is an extremely hot and noisy place to work, with temperatures in excess of 47 degrees C being normal. The engineers work in this space with the ship pitching and rolling, and find they can only work in this environment for about thirty minutes at a time, unsurprisingly. We generate our own electricity on board, using power from the engines. This power is supplied to the main switchboard room, where it is distributed and transformed for the appropriate supply, for example 415 volts or 230 volts as needed for different machinery and domestic purposes. Winches, for example, need a different voltage supply to freezers. 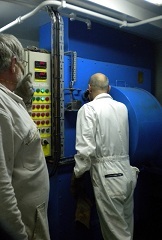 Every working part of the ship is inspected each day to check its condition. Any repairs are made whilst at sea, using the ship's own workshop. The incinerator is lit every day for rubbish disposal and watched until it has safely burnt its contents. We're strictly told not to place batteries or aerosols in the bins for burning, because they explode if burnt. All the ship's systems are managed by computers and can be controlled from more than one place, if need be. The on-deck systems are managed by members of the ship's deck crew. 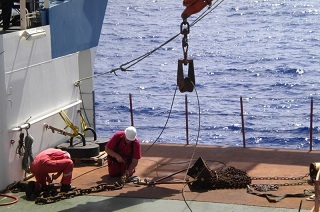 When launching equipment such as TOBI (Towed Ocean Bottom Instrument) from the stern, the deck crew wear safety harnesses for handling ropes. They also use a 'belly-box' (a remote-control box that fits around the waist) to drive the winch systems, meaning they can be on deck and see what is happening, responding quickly as the situation changes.